Primary Natural Resources timber, gemstones, hydropower potential. 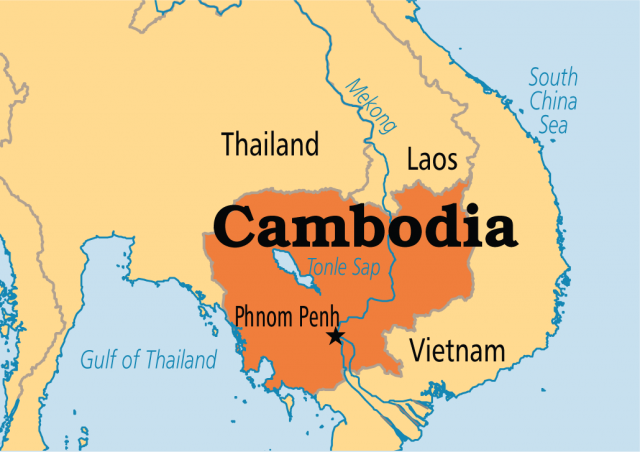 BORDERED BY VIETNAM, LAOS, and THAILAND, Cambodia, with a near circular shape, is a perfect example of a compact country. The country can be divided into several physical units: Elephant and Cardamom mountains to the southeast, parts of Annamite Cordillera to the northwest, upper part of the Mekong delta to the southeast, Tonle Sap Lake and its basin to the center and the west and the Mekong River basin between the Cordillera and Tonle Sap. As the Mekong floodwaters rise, there is a reverse (westward) flow into Tonle Sap, which increases the lake depth by over six times. Tonle Sap thus takes up the excess Mekong waters during the monsoon. Thereafter, the lake water resumes its normal eastward flow to Mekong. Three distinct cultural-historical core regions (Funan, Angkor, and Phnom Penh) can be identified in Cambodia, stretching over a period of 2,000 years. Funan’s (1st to 7th centuries) capital was on the Mekong Delta at Vyadhapura (Banam). The Funan society and political system were highly influenced by Indian conquests. The Khmers established a powerful core area based in the Angkor area (802–1432). The Khmer kingship gave rise to one of the most powerful and long-lasting theocratic states in the world and determined not only the dynastic lineage but also the political, social, economic, and agricultural features of the land. Productivity of the land and the belief of the people in a god-king were at the roots of Angkor’s power base. The demise of the Angkor core may be attributed to loss of agricultural surplus, depopulation due to malaria, and army weakness. After the fall and disappearance of Angkor, Phnom Penh emerged as a core region ruled by different rulers. French occupation of Cambodia lasted 90 years (1863–1953). The country got its independence in 1953 and had a stable government between 1953 and 1969 under the leadership of Prince Sihanouk, who abdicated his throne in 1955 and organized state elections for the first time in Cambodian history. After the coup d’etat staged in 1970 by his prime minister, Lon Nol, Cambodia came under military rule. The Khmer Rouge (Communist Party) led by Maoist premier Pol Pot displaced Lon Nol in 1975. Khmer Rouge considered cities to be parasites living on agricultural surplus. Thousands of city dwellers were driven out to villages in order to increase rice production. Phnom Penh’s population was reduced to 200,000 from 2,000,000 in 1976. Formal schooling was abandoned. Religion was virtually abolished, while pagodas were converted into storage and military places. In the process, 1 million people died between 1975 and 1978. In 1991, a Cambodian peace agreement was signed. The new government established rights to freedom of political beliefs, assembly, and publication and a market-based economy. However, Cambodia remains troubled by unrelenting political volatility and insurgence. Cambodia is one of the poorest countries of the world. Population growth has been uneven because of political and social events. The infant mortality rate (76 per 1,000) is high, and a large proportion of the population (39 percent) is under 15. Presently, population growth is slow (1.8 percent annually) due to the AIDS epidemic; 170,000 persons lived with HIV/AIDS in 2001. Cambodia is essentially a rice-growing agricultural country with 80 percent of its labor force engaged in agriculture. Only 20 percent of its GDP is derived from industries that include garment making, rice milling, wood products, and rubber. Tourism is the country’s fastest-growing industry.